Saturday marked the year’s first gorgeous spring weekend. Naturally, everyone and their mother flocked to the Brooklyn Bridge, which quickly filled to capacity. At least, the promenade did — the car lanes below still had plenty of room. On the promenade, there was barely room to walk, and biking was out of the question. The crowds shuffled along in a claustrophobic procession, visible in a stream of photos shared on Twitter. So many people were crammed together at one point that NYPD restricted entry, according to one report. It was an extreme version of what happens on the Brooklyn Bridge nearly every nice, sunny day. Pedestrian crowding on the bridge has intensified in recent years, making it an increasingly unworkable bike route, despite being a far more direct path between Brooklyn and Lower Manhattan or the West Side Greenway than the Manhattan Bridge. Unlike the three other East River bridges, where daily bike crossings have risen over the last decade, the number of people biking over the Brooklyn Bridge is declining. DOT has a long-term plan to relieve crowding by widening the promenade, but it’s alarmingly clear that the situation has to be addressed faster than the agency’s timetable allows. In December, DOT announced plans to study the feasibility of expanding the promenade, with more separation between pedestrians and cyclists. But even if the study concludes that the promenade can be widened, construction would not wrap up until 2023 at the earliest. The city could provide immediate relief by repurposing a traffic lane for bicycling on the bridge roadway. DOT has rejected that option, citing potential traffic impacts in downtown Brooklyn as the primary obstacle to a roadway bike path. But the agency only modeled the feasibility of a path on the Manhattan-bound side of the bridge. A path on the Brooklyn-bound side of the bridge would presumably affect traffic less, since the evening rush hour is more dispersed. Whatever the impacts on car traffic may be, the plight of people walking and biking should take precedence. The city has floated some short- to medium-term ideas that would relieve some of the worst bottlenecks, including a bike ramp on the Manhattan side that would bypass the path’s narrow entrance. DOT also wants to limit vending on the promenade. Those tweaks will provide modest relief, but on many days the bridge will remain cramped and miserable unless DOT takes a lane from car traffic. The vending is insane. With all the police on the bridge, never have seen them say anything to them once. That begins to become dangerous. It looks like the day of the last blackout, in 2003, when I was afraid people would be crushed to death on the promenade, as they were the first weekend the bridge opened. People were climbing over the fence and down to the roadway, where others were walking amidst the cars. My wife was pushed back from half way to the first tower back into Manhattan before going back on the road. It’s the line to the cookie dough place in Greenwich Village. It starts at the Brooklyn Bridge on the Brooklyn side, moves pretty quick though. Sooner or later there will be a terrorist attack on the bridge that kills scores because of this congestion. These people are sitting ducks. you mean too much bike traffic in brooklyn ? Very true. Every time I go back to NYC, I keep thinking about how much of a police state it is. You go to any place where a terrorist attack is expected, and it looks just like when a ‘VIP’s’ motorcade is going by in a dictatorship. There are so many police!!!! Except, the police officers watching out for the dictator’s motorcade are more attentive to their job and therefore more intimidating!! At least they have a purpose and are not just useless NYPD people. Lol there’s plenty of space in Brooklyn that bike traffic shouldn’t be an issue. All you have to do is get rid of the cars that transport able bodied people. Did they really only look at the wrong side of the bridge for a lane switch? WTF? The deck needs to be widened for pedestrians only and the south side, inner lane should be made a two-way bike path. 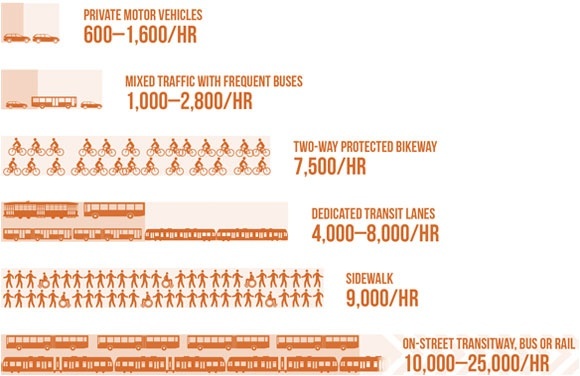 Why is driving into Manhattan being prioritized over walking and cycling? Because elected officials get special parking perks and therefore get around by car at a much higher rate than their constituents. As great as it would be to repurpose a lane on the main bridge for bikes, I must point out that, in this case, it would do nothing to ameliorate the overcrowding of pedestrians. Yup, but it’s useful to illuminate the fact that the idea of widening the upper deck with additional space for cycling is bunk: that deck widening is needed, but cycling should still go on the current road. The only reason to delay doing that is that the inner lanes might need to be closed temporarily for the pedestrian deck widening. Those interceptors should be banned from the walkway for safety reasons. They make the crowding so much worse. I would be afraid to do so (motorists are incredibly aggressive on bridges), but can you just bike on the bridge roadway as it is now? I believe the answer is no — illegal as well as unwise. The bridge is the equivalent of a limited access highway. And that speed limit? Forget it. You can’t expect those heroic warriors risking their lives for us to play candy crush for 8 hours do you ? you certainly can not expect those glorious people to walk to they’d station ? I was there on Saturday – best friend visiting from DC had never done it before. Limit? Try just banning the f***ers outright. They can easily plop down at either end of the bridge outside of the bottlenecks. Why the hell are they allowed to take up space on the promenade in the first place? While we’re at it, can we ticket people for stopping to take group photos in the middle of the walkway? Get off to the side, people! I ride, walk, and drive the Brooklyn Bridge all the time. It’s my best route home. Yes, we need relief on the promenade. Mostly, I ride my bike. But cycling has become unmanageable and taking the Manhattan bridge from Cobble Hill to Battery Pk is less than ideal. A converted car lane might work, but I don’t think, David Meyer, that you have ever once driven across the Brooklyn Bridge. I do. Frequently enough. And no one with eyes on that bridge thinks the Brooklyn-bound lanes have more room to spare than the Manhattan-bound side. 3am going to Brooklyn, it’s still bumper to bumper. 8am rush hour to Manhattan is bad, but EVERY hour to Brooklyn is bad. Suggestions like yours, above, is why we will never have nice things. You play devil’s advocate by being ‘on both sides’ and yet offer no solution. I don’t think it is suggestions for improvement which limits our access to ‘nice things’, rather the lack thereof. I don’t have a solution, no. But that doesn’t mean I can’t identify a BAD solution. More stupidity in the world has been justified with the phrase, “well, we had to do SOMETHING,” than I care to recount. So no, we don’t have to do something. We have to do something that works. Yes, both the drive and walk/ride sections of the bridge are crowded. The choice to expand one and reduce the other, or not, is just that, a choice. And your choice demonstrates your priorities. By not choosing to expand the walk/ride section at the expense of the drive section, the City prioritizes driving. Sixteen months after DOT Commissioner Polly Trottenberg announced a study of expanding the Brooklyn Bridge's narrow path for walking and biking, the results are finally here. But a wider path is still at least several years away, if it proves feasible at all. A frustrating gap in the Lower Manhattan bike network is about to get filled, as DOT crews wrap up installation of a curb-protected bike lane outside City Hall. An early morning crash shuts down the fabled span.